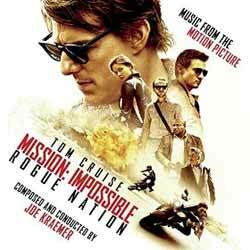 The direction for the music for Mission: Impossible: Rogue Nation could so easily have gone down the high tech route of creating a rock based electronic score, but composer Joe Kraemer was keen to give the movie a timeless feel while paying homage to the original TV show, by only using instruments that were around in the '60s. The end result is a score that is free of synthesizers, techno loops, essentially all electronic instruments, and the results speak for themselves. This is a soundtrack that could have been produced 40 years ago, or 40 years from now. In places this is a soundtrack that wouldn't have sounded out of place in any one of the early James Bond movies that John Barry composed. There's also a short segment of music that is, note-for-note, borrowed from 'Nessun Dorma'; Puccini's aria from the final act from Turandot, but made famous to the masses when Luciano Pavarotti's 1972 recording was used by the BBC for coverage of 1990's FIFA World Cup, which was hosted in Italy. Having not seen the movie, I'm not sure whether Kraemer is referencing something in the film or whether it's just a very odd coincidence. Of course, it wouldn't be a Mission: Impossible score without incorporating Lalo Schifrin's original TV theme. Kraemer basically uses it unchanged, just gives it a little bit of a tweak for this cinematic outing. The album contains 19 tracks (1 hr, 13 min, 34 sec), but it's the final track, 'Finale and Curtain Call'	which opens with this score's most beautiful segment of music. In fact, this track (6 min, 14 sec) packs just about every interesting theme from the score into its short running time. Kraemer delivers a surprisingly fresh and exciting old style blockbuster sound that will appeal to fans of John Barry's work.